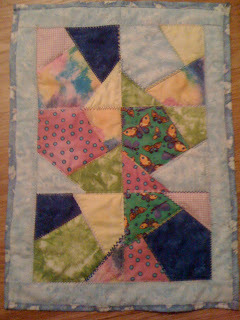 This is the doll quilt I made for Susan, using some leftover blocks from Sophia's baby quilt (they've been hanging around for a long time now, since Sophia was 6 in December!). I had fun with the embroidery, but discovered that my machine really isn't meant to do much of it. However, I'm pleased that I finished the project, considering my track record on swap-like things. I'm a wife and mother, a quilter, seamstress, knitter, and reader of novels. I'm fond of chocolate, red wine, and things handmade.